As the warm weather approaches (finally!!!) I'm looking more and more into sheer face products. New York City summers are humid and gross, so my makeup choices have to be pretty darn sweat-proof or sheer enough to let my skin breathe. Today I'll be taking a look at a base product that promises a sheer and beautiful facial finish: Pacifica's Alight Multi-Mineral BB Cream. "Think sheer moisturizing tint with benefits. A true multitasking miracle that hydrates, primes, illuminates, and perfects leaving a sheer bare skin finish. Specialized mineral pigments that instantly adjust to your skin shade allows one color to work for many. The sheer application can be built up for just the right amount of coverage. In addition, this amazing BB Cream formula contains high performance anti-aging botanical ingredients that revive and re-mineralize skin for a natural glow. Your skin will look natural, dewy, youthful and radiant without looking like you are wearing heavy make-up. What you should also know: Don't expect this to be a heavy foundation. This is more close to a tinted moisturizer leaving you with a natural finish." One thing I really appreciate about Pacifica is how honest they are about the limitations of their products on the website. Problem is, if I were to randomly come across this in Target or wherever thinking it was a higher-coverage BB cream, I would be disappointed. The sheerness level is not clear from the description on the box. water, gylcerin, caprylic/ capric triglyceride, cetearyl olivate, sorbitan olivate, sorbitan sesquioleate, simmondsia chinensis (jojoba) esters, iris pallida (sweet iris) leaf cell extract, rosa damascena (damascus rose) leaf cell extract, cocos nucifera (coconut) water, laminaria hyperborea (kelp extract blend), hyaluronic acid, potassium cetyl phosphate, hydroxyethylcellulose, titanium dioxide, iron oxides, iron oxide black, mica, potassium sorbate, sodium dehydroacetate, sodium benzoate, citric acid, punica granatum (pomegranate) extract, tetrahexyldecyl ascorbate, white tea extract, aloe barbgadensis leaf juice, fragrance (all natural). I ran the ingredients through CosDNA and it didn't flag anything as possible acne triggers or irritants, yay! This seems like a good time to mention that all Pacifica products are free of animal ingredients/testing (which makes them vegan-friendly). 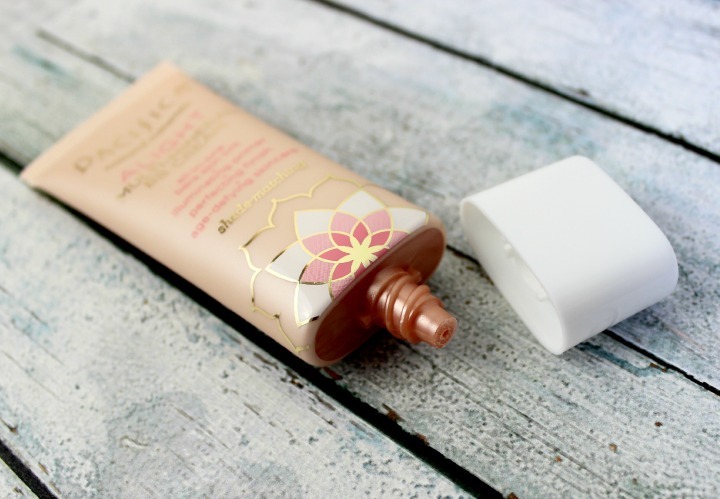 The BB cream is housed in a slim (and very pretty!) squeezy tube with a small opening. I like this type of packaging for BB creams because it makes them very travel-friendly, though the one downside is that when the product separates (and it can separate if you don't use it every day), it will squirt out a little of brown liquid on your first squeeze. Mmm, brown liquid. Delicious. See the sparkles? 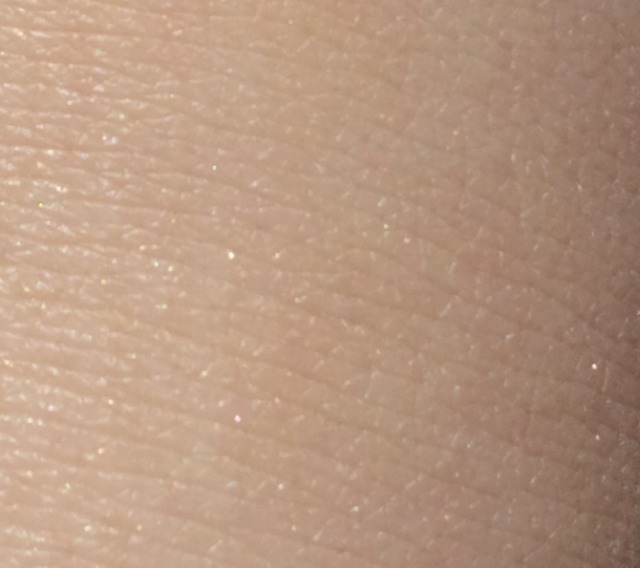 Applying this BB cream isn't quite like dousing yourself with craft glitter, but it sure as heck won't suit folks who make a point of avoiding sparkly products outright. I woke up like this! (No, really. Look at my sad, tired eyes.) As you can see the Pacifica BB cream doesn't really do anything to cover up my dark circles, conceal redness etc. My skin looks slightly more luminous, but that's about it. I don't think Pacifica should call this product a BB cream, because it really isn't. This would be best described as a very sheer, luminizing moisturizer. (How to fit that description on the tube though?) The good news is that the texture is very light, so it would be easy to use this as a base under another foundation or BB cream for a more luminous effect. One piece of advice: Despite the sheerness, you do have to blend Alight really, really well. Especially if you're pale like me. It looks tan and streaky when it's first applied to the skin, but that goes away once it's thoroughly blended. Other thoughts... this stuff has a floral, sunscreen-esque scent. It isn't a sunscreen product though. Curious. Overall I think that Pacifica Alight Multi-Mineral BB Cream is a decent product if you understand that it's more of a tinted moisturizer than a typical BB cream. But if you don't realize that and are expecting something more foundation-y, you'll hate it. I think I'll continue to use this product, but not just on my face... you know those "glow lotion" type body products that you use to make your body skin look a little more radiant? I don't like self-tanners, so I think I'll try it in that context. Or as a primer on my face the next time I'm feeling particularly sparkly. 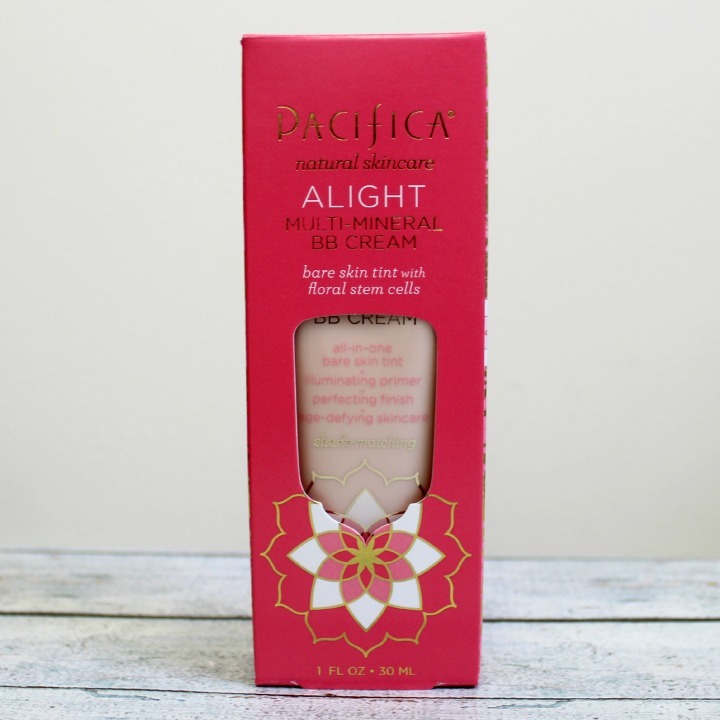 What do you think of Pacifica's Alight Multi-Mineral BB Cream? Do you have use in your routine for a base product that's sheer and a little bit sparkly? Pacifica really does knock it out of the park with pretty packaging. I was surprised at how well it blended in too - it looks soooo tan right out of the bottle. Thanks for the heads up! Its def more sheer but does give a nice glow. I DEF thought it was going to be too dark and yellow on your skin. Oh me too. When I squirted it out of the tube I was like "HELL NO", haha. It's slightly yellow on me but still sheer enough to be wearable.